So many things to see as one travels the country. As we crossed South Dakota, my eyes were attracted by a large statue on Interstate 90 in Chamberlain. I grabbed my phone and googled the statue, its reason and its installation on the banks of the Missouri River at the Lewis and Clark rest area where it overlooks the river. I discovered a soaring 50 feet/15.24m high, 16 feet/4.88m deep and 32 feet/9.75m wide stainless steel sculpture entitled Dignity created by South Dakota Artist Laureate Dale Lamphere. Dignity represents the courage and wisdom of the Lakota and Dakota people who hail from the area. 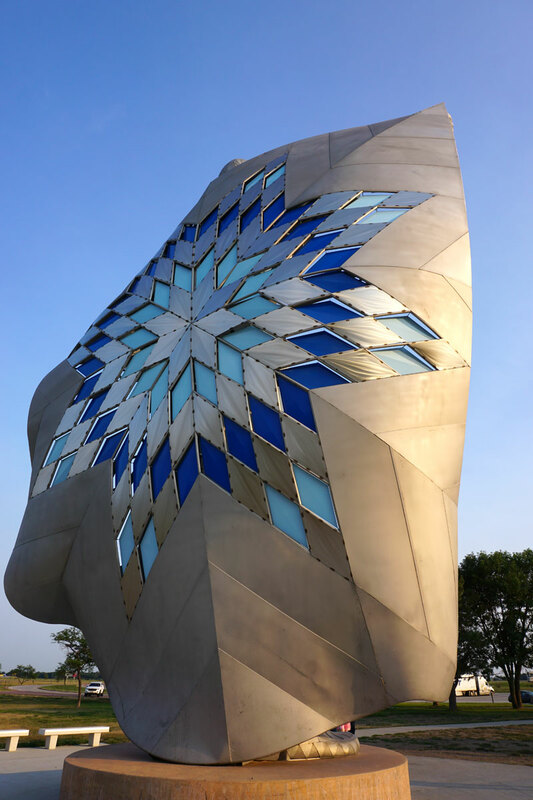 The statue depicts an American Indian woman holding a star quilt made of 128, 4-foot-tall glass diamonds in shades of blue that move in the wind "like an Aspen leaf." The colours in the quilt shift in intensity depending on the time of day. colours in the quilt shift in intensity depending on the time of day. The glass diamonds also spin when the wind passes through them so as to reduce the statue's wind resistance. "In the shadows or at night, that dark blue looks really dark blue. The sun shines lighten up the colours" says Brook Loobey, who painted the glass diamonds. Dale Claude Lamphere has created over 60 public monumental sculptures from Washington, D.C. to Burbank, California. He recently installed a 23’stainless steel and stone sculpture in Snowmass, Colorado. Additional recent monumental sculptures have been placed in Chicago, Kansas City, Colorado Springs, Omaha, and Dallas. Lamphere has consistently derived direct inspiration from the land and people of the prairie and mountain environment where he lives. Innovative use of new materials and technologies are frequently incorporated on his evocative and elegant sculptures. If you travel by Chamberlain, South Dakota, do not miss this inspiring and amazing sculpture. This short two-minute video shows the statue Dignity from the air. A Bridge Between Two Cultures filmed by KOTA TV in September 2016. This video is approximately 25 minutes long, but if you are interested in the production process, it is excellent. The statue was commissioned by a Rapid City couple.